The Academic Program offers the highest quality instruction to students of all skill levels ages 4 years old and up. In addition to private lessons, students also have access to various group classes and performance opportunities at no additional cost. The Academic Program is set up on a semester schedule: fall semester and spring semester. Each semester consists of 15 private lessons. Lessons are once a week and are scheduled based on the student and instructor's availability. All lessons are held at the academy. A completed schedule of the group classes and performance opportunities can be found on the website calendar. 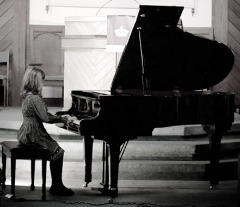 Students may receive private instruction in Piano, Violin/Viola, Cello, Clarinet, Flute, Trumpet, Voice, Guitar (Classical, Brazilian, Flamenco, Jazz or Improvisation), Harp or Organ. Theory/Ear Training, Composition, Masterclasses and Performance Classes are included and offered to all students. String Ensembles are offered to all String students and Guitar students are encouraged to join the Guitar Orchestra. All these programs are also available to non-CAM students for a fee. Find out more about the complete curricula here. CAM is launching a new Music Discovery Program aimed at toddlers from 8 months and up. This program will be taught by our Stephanie Chevalier and Katherine Clarkson. The program takes advantage of the benefits of early childhood music education and enables the young ones to explore the exciting world of music through games, songs, and books, among other activities in a highly educational and interactive learning environment. The fee for 12 sessions is $240.